Learn more about RF Integration’s SiP capabilities and what we can do for you? System in Package (SiP) solutions offer a short term improvement inoverall System Cost and Board Space. 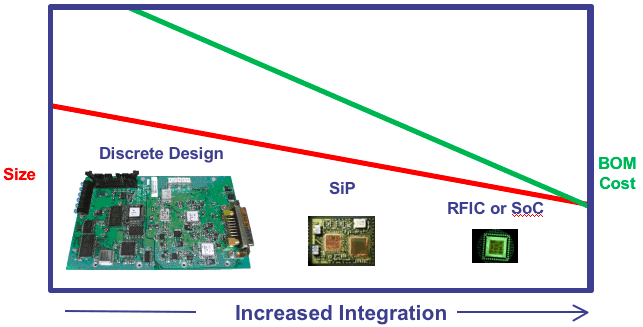 SiPs can be designed with existing RF Integration ICs or third party ICs. SiP design techniques yield 40-60% size reduction and 20% cost reduction with development lead times of 6 months. SiP solutions fill the gap between expensive bulky discrete designs and IC based solutions. Case 1 - Consumer Electronics. RF Integration reduced the size of a customer’s digital audio solution by 81% going from concept to production in 6 months. Case 2 – Data Links. Leveraging one of RF Integration’s existing direct conversion ICs, a SiP design reduced the bill of materials from 1100 components to 380 components. The corresponding board size reduction was 54%. RF Integration developed a ruggedized module for an ultra wideband (3.5 to 7GHz) radio system including all the passive components. RF and baseband signal processing ICs and Embedded filters were all integrated into a rugged LTCC based SiP solution. What can RF Integration’s SiP solutions do for you?